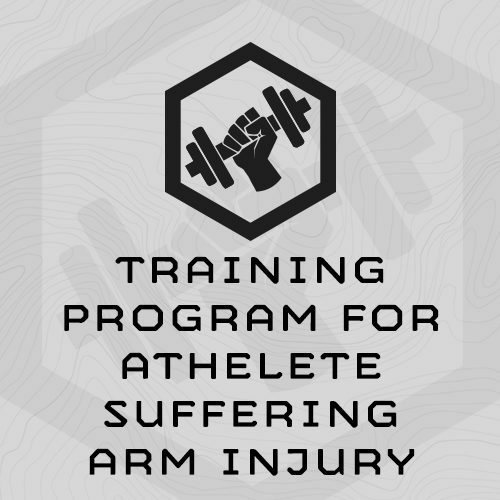 This 6-week training program (30x total training sessions) is designed for athletes who suffered an arm injury and can’t use that limb for training. This program is designed to keep these athletes training hard and in the gym during their recovery. This program is not a rehabilitation program or orthopedic program for your injured limb. Instead, it aims to train around your injury by working your good arm, legs, core and lungs/heart. Leave your injured limb alone – only train your uninjured arm. We’ve found that athletes who are able to train around injuries have higher spirits in general, and seem to recover quicker, and be stronger when they do recover, than athletes to do no training during their recovery. Your injury does not give you an excuse to quit training. We can work around it. This is Version 2 of the plan, Updated November 2018. This training plan concurrently trains strength, work capacity, endurance and chassis-integrity by deployed 1-arm version of common exercises, and leg-only work capacity/endurance exercises. ** Note – This training plan trains your body around your injured limb, but this does include jumping (box jumps) and other exercises which might jostle the injured arm/shoulder. Your recovery needs to be far enough along to handle this type of activity to complete this program. This plan deploys a modified version of MTI’s TLU Strength Progression to train strength. It deploys leg only, and 1-Arm versions of common strength exercises. Each strength session deploys a train total body strength exercise, lower body strength exercise, upper body pull, and upper body press exercise. You’ll train strength 2-3 times per week. Ten-minute, intense, work capacity events are prescribed using 1-arm and leg-only exercises. You’ll train work capacity 2-3 times per week. We’ve modified select exercises from our chassis integrity exercise library to 1-Arm versions, and deployed these in three exercise circuits. You’ll train Chassis Integrity 2-3 times per week. The plan deploys step ups, running and/or spinning on a stationary bike to train endurance, in either single mode events, or a simple circuit of two exercises. Endurance efforts are 30-40 minutes long and trained 2-3 times per week. Full set of dumbbells and/or kettlebells, bench or box for step ups, 20″ box for box jumps, stationary bicycle, stopwatch with repeating countdown timer (smartphone will work). If the session calls for 4x Walking Lunges, is that 4x Total, or 4x Each Leg? 4x each leg – 8x total. This is the same for all single side exercises – if it calls for 4x Russian Twists, this means 4x each side, 8x total, Etc. The only exception is step ups. 50x Step ups = 50x Step ups total, 25x each leg. Does a 1-Arm Exercise mean both arms – even my injured one? No – the 1-Arm Exercises are intended only for your non-injured arm. Won’t training my injured arm become too strong and unbalanced as compared to my injured arm? Your uninjured arm will definitely become significantly stronger than your injured arm …. but don’t worry about it. Studies have shown that some of the strength gains in the uninjured limb migrate to the injured limb. Training the uninjured limb will help you recover faster. Full set of dumbbells and/or kettlebells, bench or box for step ups, 20" box for box jumps, stationary bicycle, stopwatch with repeating countdown timer (smartphone will work). 10x Box Jump @ 20"
"I am loving the MTI workouts. 8 weeks ago I got my labrum completely repaired. I started the arm injury training regiment after 1 week and it has been great. Despite being in a sling for 5 weeks I was able to maintain my fitness and feel somewhat normal. I can also say that since I started my physical therapy my progress has been accelerated. I honestly feel that keeping my fitness up is allowing me to recover faster as I notice drastic changes by the day in my ROM and strength in the repaired shoulder. Looking forward to being 100% so I can dive into another training program for backcountry skiing."